By the mid 1960s, nationalists in Northern Ireland were marching under the banner of the NI Civil Rights Association. Among the leadership of the NICRA were figures such as John Hume, Gerry Fitt and Bernadette Devlin. Amongst the membership were people such as Austin Currie and Gerry Adams. Just Northern Irish politics as a whole was about to, nationalist politics was at the eve of a split, which would see each of these individuals taking on different roles at different times. In 1959, a group called National Unity was established in an effort to bring together all of Northern Ireland's nationalist political groups. This attempt failed, and the group instead turned its attentions to advising the Nationalist Party. By 1964, Nationalist Party leader Eddie McAteer held talks with the other nationalist groups in order to form a united Nationalist opposition. Although these talks were moderately successful, disagreements arose, resulting in the resignation of several Nationalist MPs - John Hume among them. By 1965, National Unity had evolved into a party in its own right, the National Democrats. In the election of that year, one of its candidates won the Belfast Central seat. Republican Labour meanwhile won the seat previously held by the Irish Labour Party in Belfast Dock. 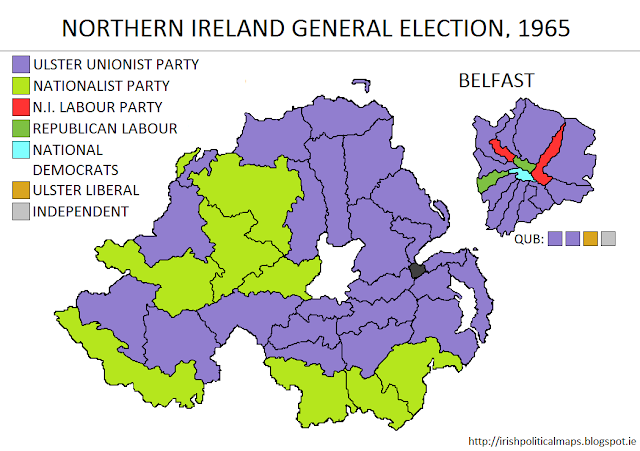 Aside from NILP losses to the Ulster Unionists, this election otherwise saw no changes to the political landscape. But with the civil rights marches continuing, relations between North and South improving, and pressure mounting on Prime Minister Terence O'Neill to bring in reforms, the almost forty year long period of political stagnation which marked Northern Irish elections was about to end.